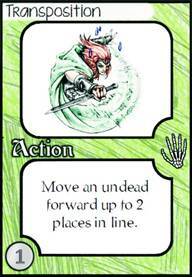 The Boneyard game consists of 3 types of cards; Avatars, Undead and Hand cards, as well as at least 1 four-sided die. Each of these play a role in your battle to quiet the unliving horde. Each turn, one player must confront the undead at the front of the line (FoL). To defeat the undead he or she must have a HIGHER strength (Str) than the undead. You can find your strength at the top right of your avatar card. Your avatar’s ability can be used any time you are the active player. To win the game you must have the undead listed at the bottom of the card resting in your boneyard. At the start of the game place 5 undead in a line. The FoL is furthest from the undead deck. At the start of each player’s turn add a new undead to the end of the line (EoL). FRESH CORSPE: The newest undead in your boneyard is called your fresh corpse (FC). BREEDS: There are 4 breeds of undead, skeletons, zombies, ghouls & wraiths. If you fail to defeat an undead its breed determines the consequence. Hovering Wraiths are indicated by cardboard disks that come with the game. AFFINITIES: There are four affinities of undead, blood, bone, ash & rime. If your FC has the same affinity as the undead you are confronting you gain +2 Str. 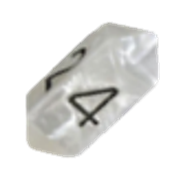 If it has the opposite affinity you have -2 Str. LESSER / GREATER / DIRE: Most of the creatures you will face are lesser undead. Greater undead have additional abilities that can affect the game. When a greater undead is added to the line, read aloud its power for everyone. Dire undead are a type pf greater undead that have game changing effects. They are not one of the four standard breeds but they do have one of the four affinities. Dire undead can be played with an optional rule. Once the Dire undead leaves the line, put to the side rather than into the undead deck. This way if the undead deck cycles out and is reshuffled the dires do not return. The basic game comes with 2 Necromancers. At the start of the game draw 5 hand cards. 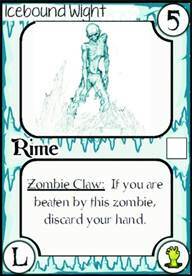 On your turn, after you add a new undead to the line you can draw a card. If you have FEWER than 3 cards in your hand you can draw 2. You can only have 8 cards in your hand at the end of your turn. If you have more than that you must discard any extras. THROW A CARD: On your turn you can throw a hand card to add +1 to your Str. This can only be done once per turn. It does not matter what kind of card you throw as the card’s effect does not activate. There are four types of hand cards. ACTION: You can play one of these on your turn. The effect lasts until the end of the turn. 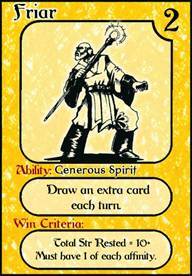 BLESSING: These can only be played on your turn but you can play as many as you have. The effects last until the end of the turn. CURSE: Curses are only played on other player’s turns. You can throw a curse on your turn since its power does not activate. When you confront an undead you get to add the result of a d4 to your Str. 1) Add undead to EoL 2) Draw card(s) 3) Confront FoL.